NOTICE: Requires the base game BioShock Infinite in order to play. Activation key must be used on a valid Steam account, requires internet connection. ABOUT THE GAMEThis first add-on pack puts an intense focus on BioShock Infinite combat. Combine weapons, Vigors, Gear, Tears and Sky-Lines in ways you never thought possible as you square off against impossible odds. This pack features 60 challe… nges in 4 brand-new maps. Complete Blue Ribbon Challenges and unlock concept art, Voxophones, Kinetoscopes, and more in The Columbian Archeological Society. SYSTEM REQUIREMENTS Minimum OS: Windows Vista Service Pack 2 32-bit Processor: Intel Core 2 DUO 2.4 GHz / AMD Athlon X2 2.7 GHz Memory: 2 GB Video Card: DirectX10 Compatible ATI Radeon HD 3870 / NVIDIA 8800 GT / Intel HD 3000 Integrated Graphics Video Card Memory: 512 MB Sound Card: DirectX Compatible Recommended OS: Windows 7 Service Pack 1 64-bit, Windows 8 Processor: Quad Core Processor Memory: 4 GB Video Card: DirectX11 Compatible, AMD Radeon HD 6950 / NVIDIA GeForce GTX 560 Video Card Memory: 1024 MB Sound Card: DirectX Compatible Initial installation requires one-time broadband internet connection for Steam authentication and Platform Update For Windows Vista (KB 971644 required on Vista only for DirectX 11); software installations required (included with the game) include Steam Client, Microsoft DirectX Runtime, Microsoft Visual C++ Redistributable 2008 SP1, and Microsoft Visual C++ Redistributable 2010 SP1. If you own the BioShock Infinite Season Pass, DO NOT purchase this content here as you will be charged again. ©2002 – 2013 Take-Two interactive Software, Inc. Developed by Irrational Games. 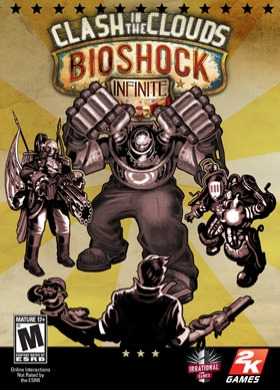 BioShock, BioShock Infinite, BioShock Infinite: Industrial Revolution, Irrational Games, 2K Games and their respective logos are all trademarks of Take-Two Interactive Software, Inc. All rights reserved. The ratings icon is a trademark of the Entertainment Software Association. All other trademarks are property of their respective owners.